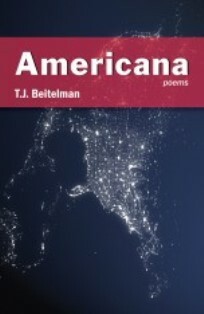 “Why do I love such a city / as this?” asks the observant and bemused speaker of TJ Beitelman’s “Why I Love a City” from the Birmingham author’s just-published second book of poems, Americana. The thought continues: “Do mosquitoes have thumbs? They / should. Where is Carl Sandburg when you / need him? Who are my hog butchers?” Here, and in so many ingenious and surprising places in the volume, Beitelman carefully observes and good-naturedly questions the dreams and realities of Americans and their lore, mindfully engaging all the earnestness and kitsch of the culture in the best traditions of America’s great city poets. Walt Whitman, Frank O’Hara, Elizabeth Bishop, Kenneth Koch—and of course, Carl Sandburg—are all present here one way or another, and their collective influence is put to fine use in conversation with Beitelman’s own distinct, contemporary voice. Each section of the book sees the poet slightly expanding his field of view and employing a more daring array of forms in order to address his ever-larger concerns. First, in “Occasions,” Beitelman offers his fresh and winning take on the very old tradition of occasional verse. “Upon the Thirtieth Anniversary of Hank Aaron Surpassing Babe Ruth as All-Time Homerun King” and “A Sonnet in Remembrance of Being Propositioned During Intermission of a Tom Stoppard Play, Blacksburg, Virginia, March 18, 1995” are two such examples.